Earlier this year, I wrote a column in which I pointed out that the city was doing an extremely poor job of replacing street signs. Now, months later, things have become much worse. Too many times, I’ve come to an intersections where signals and street signs were missing or broken. Although poor maintenance is practically a hallmark of New Orleans governance, lately it has grown into something else. It’s as though the city has just given up. I’m starting to fear that Public Works is completely defunct. I would half-expect to find a rusty padlock on the door adorned with cobwebs, with an adjacent sign ominously reading “CLOSED FOREVER.” With the exception of major projects, like repaving major streets, work is at a standstill. Basic maintenance is falling by the wayside. This Sunday, I decided to chronicle the evidence. I drove around the streets surrounding my home to those intersections with particularly poor signage that could, if not remedied, be the cause of major accidents. My brief efforts yielded the following photo essay. This is a picture of the intersection of Felicity Street and St. Charles Avenue taken from the lakeside of Felicity. You’ll note that the traffic signals are not working and temporary stop signs have been placed on both streets. 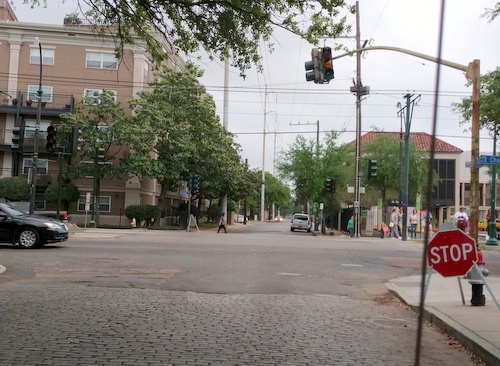 With the presence of the St. Charles streetcar and a four-lane boulevard, it’s a particularly dangerous location to be lacking a functioning traffic signal. Alone, this would not merit much attention; traffic lights go out all the time, and sometimes they may take a few days to repair. However, this particular stop-light has been out since before Mardi Gras. Yes, it went out in the middle of February, well over a month ago. There has been no indication, other than the placement of temporary stop signs, that Public Works is doing anything about it. What’s going on? Next — featured in the photo at the top of this column — we see the intersection of St. Andrew and St. Charles Avenue from the lakeside, just two blocks over from the previous photo. Do you see what’s missing? If you said “a stop sign,” you’re absolutely correct! 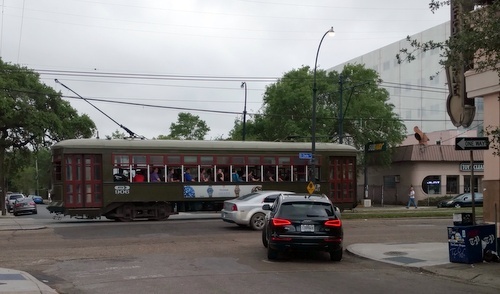 There is no stop sign notifying drivers on St. Andrew, a one-way street, to stop at St. Charles, a two-way boulevard with a wide neutral ground featuring streetcar service. Now, I’m sure my loyal readership is completely aware of the fact that cars on all side-streets must yield to traffic on St. Charles. However, those unfamiliar with the city, like tourists, may simply drive blithely into a wall of traffic in the absence of a blasted stop sign. It is also worth noting that, in Louisiana, political subdivisions are open to tort suits for negligent road design and maintenance, meaning that if somebody is killed in a major accident because a stop sign isn’t replaced for an extended period, the city will wind up footing the bill (eventually) for the inevitable wrongful death lawsuit. Such a verdict would probably be in the millions. Conversely, an engineer-grade stop sign costs about $50-70 online. Does Public Works even care? Is anyone managing risk at City Hall? This photo was taken at the intersection of Robert C. Blakes, Sr., Drive (formerly Carondelet Street) and St. Mary Street. Again, this is just a couple of blocks away from the previous photo. Here, the problem is that there is only a single, lone one-way sign, and it is faded almost to white, and is placed about a dozen feet back from the intersection where it is partially blocked by foliage. There is no other “one-way” sign, there are no “do not enter” signs, and there is no stop sign for traffic coming from St. Mary. The danger imposed by this state of affairs should be obvious. At an intersection like this, there should be at least two one-way signs, and both should be placed near the edge of the intersection so that they are clearly visible. There should also be two “do not enter” signs on either post for good measure. Finally, there should obviously be a stop sign. Although it’s a t-bone intersection, a stop sign is never assumed. If somebody comes speeding down Robert C. Blakes and turns down St. Mary the wrong way due to the lack of proper signage, they may potentially be confronted by an oncoming vehicle that has not been alerted of the need to slow by a stop sign. That would surely be a magnificent collision, and it would be solely attributable to the city’s incompetence. How did this pass the city’s notice? Finally, this photograph was taken several blocks away at the intersection of First and Prytania Streets, from the lakeside of First Street. You’ll note that there is only one stop sign, and it has been turned away from the view of oncoming traffic to where it is barely visible. If you think this is a minor quibble, consider this – this section of First Street runs directly alongside the Louise S. McGehee School. Children cross this street. Visitors to our city are generally not aware that Prytania is a major thoroughfare, and if they come down First Street from St. Charles and don’t yield, they may hit an SUV full of kids (or the kids themselves). 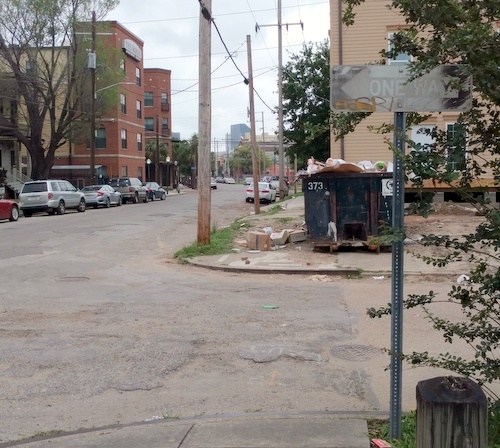 The city could have placed stop signs on both sides of First Street as a prophylactic, but they didn’t. 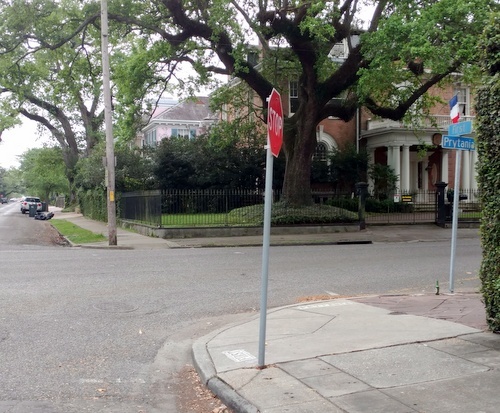 Instead, they installed revenue-generating speed cameras on Prytania and apparently ignored signage entirely. Does this not show misplaced priorities? After all, aren’t we about to spend $6 million repaving Bourbon Street? One wonders how many new street signs that could buy. New Orleans does joke about being “third world,” but even many developing countries manage to maintain basic street signage in major cities. As a city we are not particularly wealthy, but we aren’t so poor that street signs should be conspicuously absent for months on end or traffic signals should be out for several weeks. Based on my humble observations, something is getting worse. In New Orleans, that’s saying something. Have you ever taken the initiative to call 311 and report these missing signs? I call them and report missing signs regularly and 100% of the time they are fixed or replaced within 24 hours. The City can afford to fix signs and they are pretty good at doing so when they know about it. What the City cannot afford is full time staff driving around the entire city on a daily basis looking for missing signs. I would encourage you and all readers to help out by report missing signs by calling 311 from any phone. It is quick and easy. You’re excusing the city’s incompetence. The city needs to be aware of widespread problems with its own infrastructure without having citizens call in. Besides, other city employees should be reporting signage that has been missing for months (like police). Also, Public Works should indeed be regularly inspecting infrastructure. That’s the way it works everywhere else, I assure you. It should also be noted that the city is fully aware that the traffic lights at Felicity are out. They just haven’t fixed them for six weeks. That isn’t normal. As usual, you are completely full of **it. Lauren was right on target and she was not “excusing” anything, she just doesn’t share the same twisted fetish for excessive municipal criticism that you’re stricken with. Also, how does complaining about the lack of efficient city services make you in any way “anti-government”? If you were truly anti-government, you would be out there replacing the signs yourself (or taking more down, I suppose). And if you were anything approximating a real journalist, you would have talked to the Streets Dept. and maybe gotten some answers. Who knows, maybe there really is a “scandal” to be uncovered … or maybe there are perfectly good answers to all your whiny complaints. We may never know! Seriously, complaining about missing stop signs and traffic signals that have been out for six weeks is “excessive municipal criticism?” Really? You don’t see anything wrong here? And I’m not sure what you’re talking about with respect to me being “anti-government.” I’m not against government pe se; I’m against incompetent government. I’m certainly not suggesting that it’s my job to provide this city with adequate signage (although I did replace a “no parking to corner” sign next to my house with a small handmade one). Finally, I’ve contacted the city’s paid PR people in the past and the best I normally get out of them is a truncated quotation if they respond at all within a reasonable time. Writing this column is not a paid gig, and I don’t have all the time in the world to try and afford the city a mouthpiece. If they have a response to this shameful neglect, the comment section is wide open. Cannibal did not label you “anti-government”–you did that yourself in the very first sentence of this column. Sure, but as I also said, there’s a huge difference between being opposed to incompetent and overly instrusive government and simply being an anarchist. I’ve said nothing to suggest that I don’t want government to provide basic services. Indeed, I’ve repeatedly said that I want government to do a better job of doing so. Awww, the traditional simpleton who doesn’t know that journalist are doing their job when they inform the public about problems. Yet somehow every comparable sized city in the US somehow seems to handle this issue with ease. I’m also pretty proactive with emails and 311 calls. I’ve found when I report issues they are almost always handled promptly, frequently same-day. I think you are right on target. Keep up the pressure. I think you make a difference. How about another article on PAINT? Or the lack thereof. I’ll start: On Tchoupitoulas St. on the Uptown side of Napoleon, there’s a special lane for cars turning left into the Rouses parking lot. It certainly does look to drivers going towards Napoleon, however, that the lane is for them to turn left onto Napoleon. There used to be clear bright paint indicating the the lane was for cars turning left into the Rouses parking lot. No more. As you mentioned, these might seem petty or unimportant, but they’re not. Lives can be lost or serious injuries suffered. Especially since we brag constantly about how many tourists we host. I wrote a column about road striping back in 2013 right after they re-striped St. Charles Ave. Of course, the paint they used was garbage, so within a year the stripes were difficult to see. Today, they’re virtually invisible. Anyway, it’s probably time for an update. The biggest issue in the next mayor’s race should be who will make the effective delivery of basic city services like infrastructure and public safety a priority. Exactly. Instead of the fact that our streets are largely impassible and we can’t even maintain traffic signage, the past several years have seen our political class mired in discussions about banning plastic bags, tearing down monuments, curtailing live music, and ruining Bourbon Street. When we actually have a decent ongoing budget for Public Works, perhaps then we can talk about frivolous nonsense. Crime is #1; economic development is #2. I’m not sure why property tax receipts should be normalized. A lot of the problems in the city stem from outside ownership of rental properties and then turning them into Airnb, reducing supply of rental properties, and severely raising rents. That should be taxed. Florida certainly soaks Disney customers, e.g. —and did`t mention how many zillions are hidden by tree branches all over the city@!!!!! We are supposed to report them to 311, but I’m not patient enough for that. I keep a folding pruning saw in the back pocket when walking the dog for just such situations. Does anyone know if the city actually has in-house crews to do this work anymore? How many? Are they working today? I recall that they contracted out streetlight repairs a while back, perhaps stoplights too. Not sure if it’s still that way. But even then, you need some staff for oversight, one would think. There were crews of local fellows driving City of New Orleans marked trucks installing the “Photo Enforced” signs all over town. So there are a few at least. If you are questioning where the money (tax revenue is going) I’ll add this: Every 4 years when the Assessor is required to re-value all properties and the City is required by law to roll-back the tax mileage rates so that the increase in Assessment does not yield an increase in tax revenue. This seems fair, otherwise the City could end up with a huge windfall in tax revenue due to the increased burden related to high property values borne by the citizenry. But in practice the citizens in new orleans are essentially denied a voice in the process. Because there is a sneaky loop-hole in the law that allows the City to roll the mileage rate forward immediately after it was rolled back (to meet the letter of the law). This happens on a regular basis, almost religiously and with confusing and little public notice or participation. The public is unaware of it. In short it’s a huge scam that delivers big, big increases in tax revenue. Blame the Council and Mayor not the Assessor. And BTW if you are a long time resident, you know someone with a vested interest in the community, someone with roots in the city, the tax increase is not balanced against any increase in income. Also, by now the homestead exemption is practically worthless because for it is not adjusted with property value increases. I’ve been asking the Council Members and Mayor for months for more data and a clear explanation. The silence is very telling. Could the revenue increases help cover retirement benefits instead of police and fire or roads? Only two Council members even bothered to respond and nothing directly addressed the question. My property tax has increased over 1000% since Katrina. That along with insurance makes this city unaffordable and I have no voice in the process. I’ve lived here over 50 years and am proud to say I have participated in numerous civic and neighborhood issues. I’m going to have to move. The Mayor and Council have a duty to at the very least explain themselves to the public and give me back my voice. Until that day I refuse to vote for any tax increases whatsoever. The City Council is a rubber stamp Politburo. Their only duty is to follow the will of General Secretary Landrieu and other Democrats higher up in their shadowy bureaucracy. Stacy Head is the only one breaking their unanimous consent with the occasional question. I am guessing you voted for a lot of their tax increases, and it has come back to haunt you. Regardless of that, good luck. Right on cue, another right winger claiming superioriity in managing finances with the requisite commie references (ignoring his commonality to the national socialists). All we’d see is massive amounts of corporate welfare under right wing rule and plenty of lecturing about the scourge of gays. Great work Owen. Bringing some sanity & common sense to local journalism. Our papers certainly don’t do it. I like the temporary little tripod Stop signs. They suggest to me that I probably should stop, but it’s not really that big a deal if I just roll through. There has been a stop sign in lieu of fixing the traffic light at Camp and Girod for 5 weeks. The city doesn’t give a damn about anybody but the tourist. Owen is correct when he says maintenance is shoddy. But others who have commented here about calling in problems are also correct. My own experience with this was when a street light went out near my house. I called the city and the light was fixed 2 or 3 days later. That said, I like the idea that we voters make this a major issue for the upcoming elections for Mayor and Council. The condition of city streets is terrible, signs are missing and pavement markings are deplorable. I fully concur with Owen that these are problems that make the streets unsafe. It can be fixed. It must be fixed! I think both the citizens and the public employees suffer from severe laziness. Yes, the city should fix problems instead of ignoring them. But, as others have pointed out, when problems are properly reported, they are usually handled promptly. 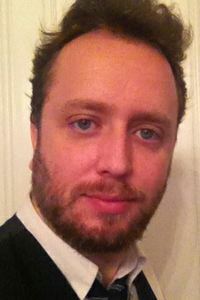 How about a followup where Owen reports these issues and sees if and how quickly they are fixed?